As a translator, you don't always have to translate a string from scratch. If the string you're translating is similar to one that was translated in the past, a translation suggestion will appear in the Editor's Suggestions tab. This works because each time a translation is saved, it's added to a database known as Translation Memory (TM for short). Then untranslated strings are compared against translated ones to see if there are similarities between the two. If a string has a Translation Memory match, it'll appear in the Suggestions tab of the Editor with a percentage next to the suggestion. The percentage shows you how similar the string you're currently translating is to the source string of the suggested translation. The higher the percentage, the more similar the two source strings are. A 100% match means the two source strings are exactly the same. In such a case, it might be safe to reuse the translation. The first is a 100% match because it's exactly the same word as the one you're translating. The second is a 66% match – while the source phrase contains the word "password," it's not exactly the same as what you're translating. The TM suggestions are clickable: the available link redirects you to the source entry where the suggested translation version was initially applied to. Find the suggestion you'd like to use and click the Use this icon. The suggestion will be copied into the translation box. Hit Save to save the translation. If you have a high-match TM suggestion, it might be useful to see what exactly changed in the source string since the time it was translated (and stored in TM) last time. It will highlight the words and characters that are no longer present in the source (in red) and words and characters that have been added to the new version of the source string (in green). Concordance search lets you search through the Translation Memory for a specific word or phrase and see how it was translated in other places. This is useful when there's no TM suggestion for a string, but you still want to see how something was translated elsewhere. Click the Concordance Search button near the top right of the Editor, or hit the c shortcut on your keyboard. 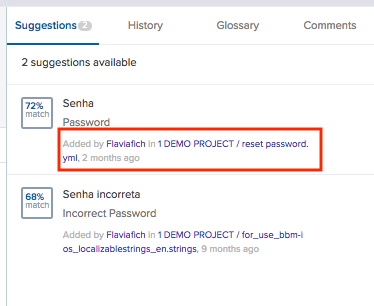 Type in your search term in the source language of the project and hit Enter or click the Search button. To the right of the search box, you'll see the matching results. The left column shows all the source phrases containing your search term (your search term is highlighted). Above the source phrase you can see the project and resource that this phrase originated from. The right column shows how all those phrases were translated. 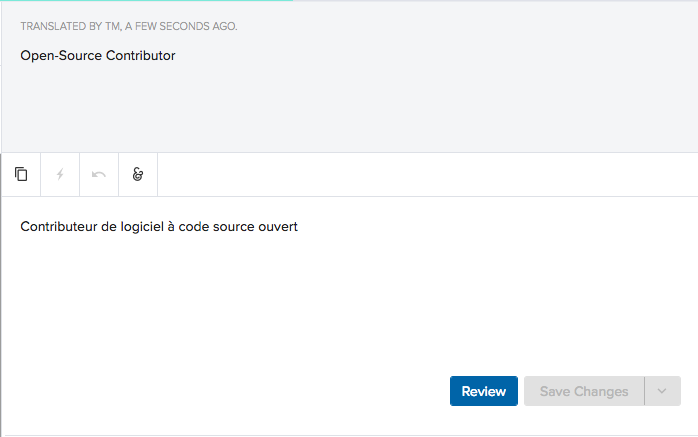 Concordance search works on top of a project's Translation Memory. If a project shares TM with other projects, then the search results will be from all those projects. See Sharing Translation Memory for more details. 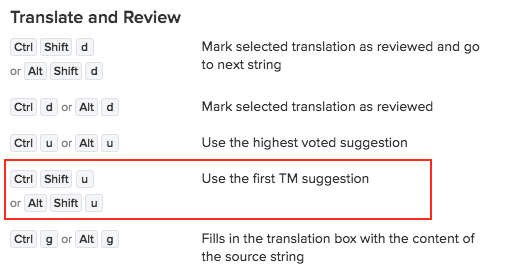 As you're working in the Editor, you may come across strings that are already translated by the Translation Memory (see the "Translated by TM" line in the screenshot below). These translations are automatically filled up from the Translation Memory, as the same source string was already translated elsewhere. To see all the strings translated by the Translation Memory, use the filter ORIGIN and select the TM from the list. 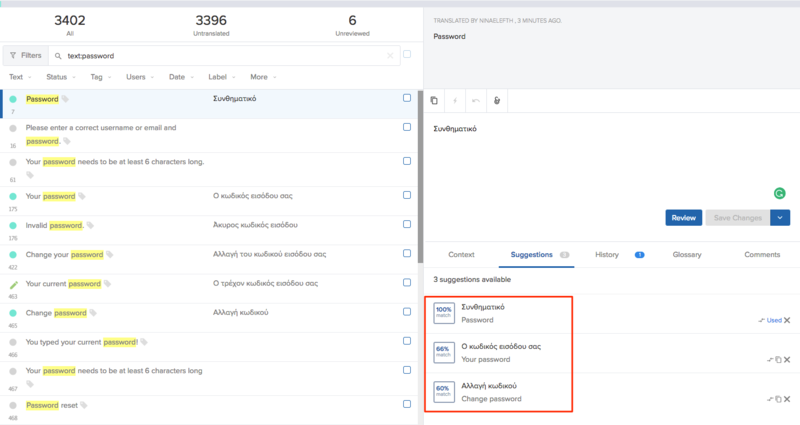 If you're an Organization Admin or a Project Maintainer, you can learn more about TM autofill in this article: Enabling Translation Memory Autofill.